The only requirement of the application is a Java Runtime Environment (>= 1.6). It's usually already preinstalled on your PC - and if not: You may get the current Java-Version from Oracle for example. A J2ME-capable device with MIDP-2.0 and CLDC-1.1 support. Java Web Start: Start the application directly from this site. Just click on the link and - in case you should see an application chooser dialogue - open the program with the default application (javaws / Java Web Start). In case you see the message that the application is not run because of security restrictions see the note for Oracle Java users below the download link. Downloadable file: As an alternative you can also simply download the application. 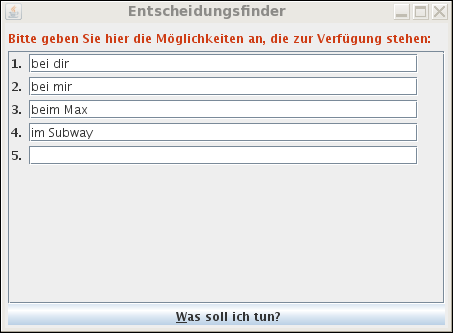 The application can be started either by double clicking the downloaded file or by executing java -jar Entscheidungsfinder.jar on the command line from the download folder. Source code: Use this link if you are a developer and want to know how the application works. Type ant to build the desktop version or see the build.xml file for further targets. J2ME: Installing the J2ME version is device dependent to a high degree. Usually you have to transfer the file to your device or download it directly on your device. After that it should be enough to just open the .jar-file on the device. Most devices will install the application then - after that you should find an entry called "Entscheidungsfinder" in the list of your phone's applications. Initially you will see an input box where you can immediately start inserting your first option. 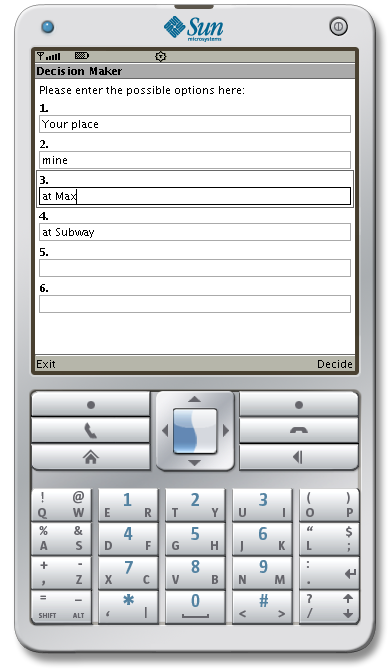 The number of input fields is automatically adjusted, i.e. there will appear a new input field at the end of the list when all other fields are occupied at the latest. Of course you can modify or completely delete your options at any time; empty fields will the deleted after leaving the field. It's not possible to sort the entries. As soon as you entered all options hit the "What shall I do?" / "Decide" button or simply press the "Enter" key to get a random selection of the options. The application is free as in free beer and as in free speech. Do with it whatever you want, as it's available under the BSD license. Added href attribute to jnlp file (for usage with Deployment Rule Set). The site last changed on 16. September 2015 19:16:04.